Your recipe to start in health’ is a mini-series of blogs to help you go through these steps. Each blog gives you information, tips, examples and a specific action you can take. Don’t want to miss any of the 5 articles? Feel free to subscribe to the dashplus newsletter community: it’s bi-weekly and completely free. What is your goal as a health entrepreneur? what is your goal as an entrepreneur? Or: where do you want to be in 1 year from now? Starting your innovation from a clear mission helps you in difficult and insecure times (be sure everyone has them!) or when the results of your innovation are not right on track as you would want them to be. Your why is your guideline, your secure base and your story to your customers. Healthcare is people’s business: your why, the goal of your health innovation, is important to many of your future customers. Your why is what Eric Ries calls your ‘pivot’ to decide what to do (go on, change or quit) after you have tested your innovation. It is what defines your company, even if you might change all other aspects of your business model during your entrepreneur’s journey. Corporates starting new products or services in health can make the mistake to start from the existing portfolio, business model or organisational structure. Your existing technology or service is not the right starting point for your innovation. It brings the risk of missing opportunities and making offers no one is waiting for. 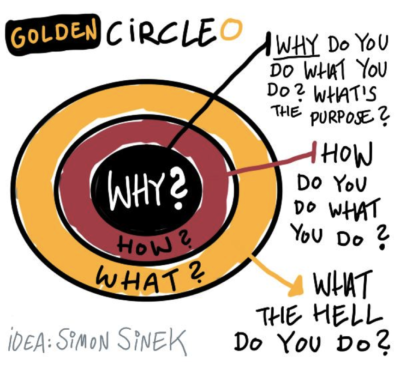 As healthcare is evolving towards value-based health in many countries worldwide, it’s important to really put your mission and your value (your outcome) central to your innovation process. So: Your first question to answer about your health innovation is not what or for who but WHY? How do you write down a good mission or a good WHY for your new project? What is your drive as a health entrepreneur? Start from your gut feeling and try to write down in easy, accessible words. Try to avoid hollow words and phrases, but write the same way you think or you would tell it to a friend or colleague. It can be useful to start writing a lot: all your thoughts fully worked out. And then start to select and write your mission as you would tell it to the public. Think about those things you do not want to change, that is non-discussable for you: what is your main drive to be enthusiastic about the health innovation you have in mind? Your mission should not be perfect. It is your basis. You still have the opportunity to change or add things later on. A little trick I use when I have to write down totally new concepts or texts is this one: time yourself 30 minutes to write down al your thoughts. Take 15 minutes to reread and to delete or add text. Than sleep over for one night. Take 30 minutes in the morning of the next day to finish your text. Ready! Leave it the way it is for now. When I started dashplus some 2 years ago now, one of the first things I did was buying a nice small notebook (i love the ones of Paperblanks …) and writing my mission in it. To be precise: write down 2-3 versions of my mission and then bringing it back to one. It’s my mission to help health entrepreneurs to start, build and grow health innovations that add quality of life for many people. I want health explorers to become health nodes. I do so by providing business advice and guiding all kinds of health entrepreneurs, via blog, newsletter and others. Siza is a Dutch disability care organisation. Their aim is to ‘make a world of difference to be able to live your own life’. They put this into action for both users and employees. As a consequence of their what and how, Siza is pioneering in the field of e-health.